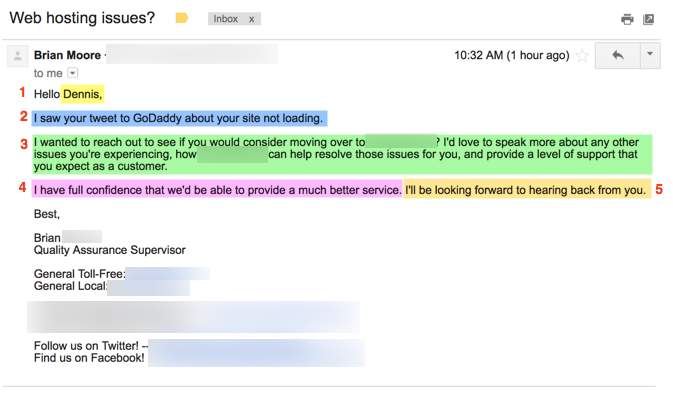 This morning, while I was dealing with a website that didn’t load right after I published a new post here, I received an email regarding my problems with my site at Godaddy. That was fast I thought, customer service really is beefed up there. Nope, it was somebody who had spotted my tweet about my site being down, and offered to help to move my site to their hosting service. This triggered a thought in my head. Are people complaining on Twitter a good acquisition target. In most cases I can imagine somebody who is willing to go public with a complaint on Twitter, is usually more motivated to move provider of a service. What’s more, selling hosting online is a competitive vertical. Getting direct access to a group of customers willing to switch to a new service, can be a wildly effective acquisition channel. Setting up an alert for any tweet directed at the CS Twitter handle of your competition is easy, and gives you a clear overview of when problems arise at your competitors. All you have to do at that point is set up an effective email template, and one or two people to do outreach. Usually I hate cold emails to sell me something. I thought this particular email was very well written, and if I didn’t already had a different hosting solution set up than Godaddy, I probably would have reached out to Brian. I saw your tweet to GoDaddy about your site not loading. I wanted to reach out to see if you would consider moving over to [name redacted]? I’d love to speak more about any other issues you’re experiencing, how[name redacted] can help resolve those issues for you, and provide a level of support that you expect as a customer. I have full confidence that we’d be able to provide a much better service. I’ll be looking forward to hearing back from you. So as a business in a market with a commoditized product, it’s key to set up alerts for your own name / products on Twitter to go above and beyond the customer service and satisfy the complainer. Otherwise, your lunch might be gone before it’s even served!